What are the biggest mistakes you see people making who are new to working with the X32? What are the main differences between X32 and M32? How do you set up the X32 for rock-solid wireless control? How do you use the X32 as a speaker processor? How do you perform a complete console backup to a USB drive? Is the Combinator a useful effect? Why is the attack knob backwards? What’s the difference between scenes, cues, and snippets? What are some pros and cons of using Waves Multirack Native vs Soundgrid with the X-WSG IO card? I once heard that in older versions of the x32 the outputs were not phase aligned. Does that have any merit? Are there any issues with latency with the normal channel strip compressor? 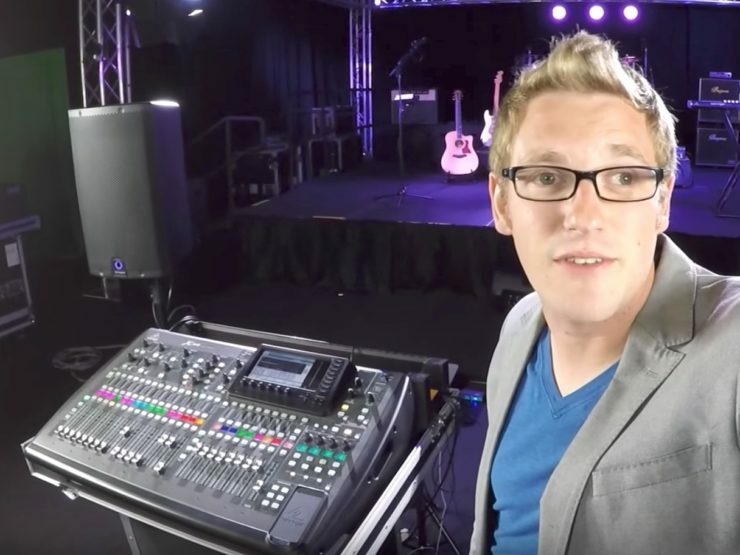 Can I use the Midas DL32 with the X32 as a budget M32? Can I go pre-fader post-EQ-dynamics through MADI directly into another X32? All music in this episode by Shutterwax. Go wired with a manual IP address. Password protect your audio network. Make sure you have line of sight with your router’s antenna. Add an antenna from wa5vjb. Scenes save and recall everything. There is a momentary break in audio throughput. Snippets save specific things like a channel mute or fader move. Cues can load both of those. Who you surround yourself with is who you will end up being. Don’t be afraid to ask a question, but always be careful who you ask that question to. Please password protect your audio network. Please, please, please. The Apple Airport Express doesn’t like to be disconnected from the internet. You will have issues with routing. If you want to give yourself a full picture of what the room is sounding like, you need to walk. You mentioned the 2000 kids coming in and suddenly you couldn’t connect to your router 3 feet away. This is why you should hide your SSID as the guy ask you. Here’s the reason… if your SSID is visible, every single wireless device that sees it will automatically ping it to see if it’s an open network or not. So, in your case, you had hundreds, maybe thousands of mobile phones hitting your router. If you hide the SSID, you will not have these issues. It’s not just about hiding the SSID though – which is indeed a very good idea precisely because of Jimmy’s point. It also involves available data bandwidth within a single radio bandwidth. I’ll try to make my point as briefly as possible. When digital data has to share its medium’s bandwidth with data from a lot of other devices, it can get corrupted and have to be sent again. As demand for bandwidth increases while the medium remains the same, so will the likelyhood of re-transmissions increase, and ultimately some delay will be introduced in getting information from point A to point B. 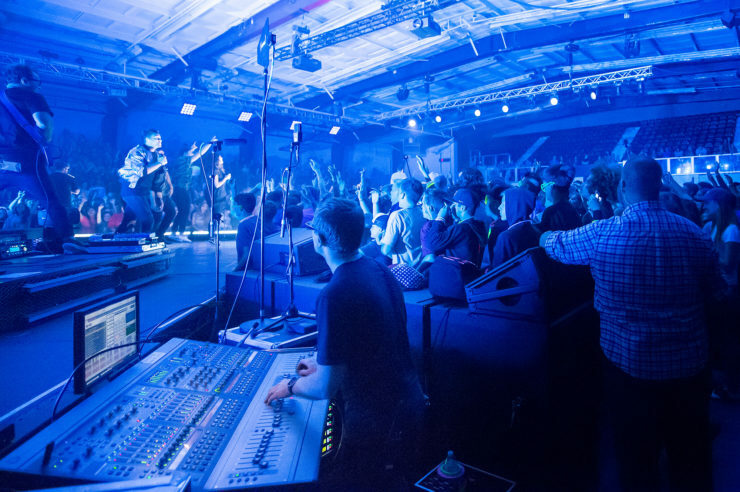 The average cellphone user simply complains that the “network is slow” and carries on, but such delays are very bad for real-time applications such as staying connected to your FOH console during a show. I believe that if you’re trying to run your FOH system on the same medium (i.e. the 2.4GHz band) as everyone else in the venue, you’re running into the limited resources issue. Go to a different band (i.e. 5GHz), and you’ll effectively switch to a (currently) far less populated medium. My experience to date has been that as long as I’m using the standard 2.4GHz band, I *will* have collisions with other people’s traffic – EVEN if they’re not accessing or trying to access my private LAN – and I finish up with connectivitiy issues. I typically ethernet cable-connect my console to a 5GHz wifi router (private protected LAN of course, *not* up-linked to the internet), then connect via 5GHz from my tablet, and the collision issues almost (almost) go away. As more and more devices and people embrace 5GHz, that won’t be so effective anymore, but for *now* it works for me. 😉 Of course, the drawback is that 5GHz is a little more than double the frequency of 2.4GHz, so line-of-sight becomes even more important, and effective range can therefore decrease a little. Thanks Ken! I just got two Bullet M5 access points.